Start a child in your life on a lifelong journey through classical music with this 9-CD boxed set from Naxos. It’s our thank you for a contribution of $120 or more to WRCJ. Order yours now. Each track is tailored for younger listeners and comes with a handy booklet describing every piece of music. 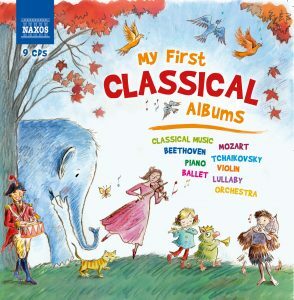 CDs are: Classical music; Beethoven; Mozart; Tchaikovsky; Piano; Violin; Ballet; Lullaby; and Orchestra. More than 11 hours of music total.